For many of us, one part of the fun that comes with yoga is the cute clothes and accessories that are available. And why not, right? Life is too short not to enjoy it as much as you can. 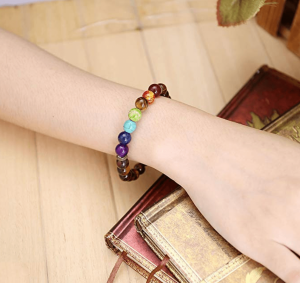 The Jovivi 7 Chakras Gemstone Bracelet is one of those cool accessories that so many of us find attractive. Yoga practitioners, in particular, will like wearing these because it is a way to show the world a unique part of your personality. Due to the various colors of the stones on each bracelet, it’s easy to pair up with most outfits. A simple accessory like this can add so much extra pizzazz in no time. Another point worth noting is that these bracelets go well with both casual and dressier clothing styles. More importantly than just being a tool to make a fashion statement, the stones have been selected for their connection to spirituality. For example, the amethyst stone is known for being a symbol of contentment and spirituality. It is also known for helping to transform low energy to a peaceful and serene state of mind while symbolizing new beginnings. Keep in mind that the bracelets are constructed with an elastic string that is threaded through the center of each bead. This makes them somewhat delicate. For this reason, it is recommended that you handle them with care. Do not wear them when you are working out or doing any other type of strenuous task. Aside from being an attractive accessory for yourself, the Jovivi 7 Chakras Gemstone Bracelet set makes a nice gift for friends and family. The price is very reasonable too which is another benefit.